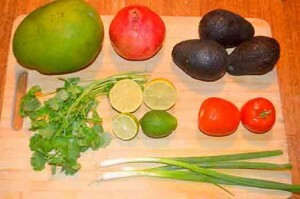 I came up with this Mango Pomegranate Guacamole Dip recipe to bring on a weekend trip to Santa Cruz, a lovely small beach town in Northern California. Even though it is Fall and it is starting to cool down in most other places, in the San Francisco Bay Area, we are in full blown Indian Summer. It has been in the mid 80’s all week which is a bit unusual for here, and I have had to run my air conditioner all week in my office! While the rest of the nation is gearing up for Fall with pumpkin and soup recipes, we are still eating ice cream (dairy-free and sugar-free, of course, check out my recipes here). 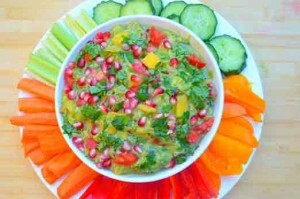 I love to eat healthy and follow the Paleo diet even I travel so I always make sure I am prepared with healthy dishes like this, in addition to this mango pomegranate guacamole dip, I also brought a bunch of cut up vegetables, pears, kale chips, roasted seaweed, turkey jerky, thai lime and chili cashews, and Kind bars. For more Paleo snack ideas, check out my Paleo Travel Snack post. To make this Mango Pomegranate Guacamole Dip, first assemble all of the ingredients. Next, chop the avocado and place in a large bowl. Juice the limes. Chop the tomato and the mango. Remove the seeds from the pomegranate. Thinly slice the green onions. Chop the cilantro. Measure out the salt and pepper. Next mash up the avocado. I use a masher that you would use to mash potatoes to do this. You could also use a fork. Add the lime juice, salt and pepper. Mix thoroughly Add the rest of the ingredients. Garnish with a little extra cilantro. Chop up vegetables for dipping. 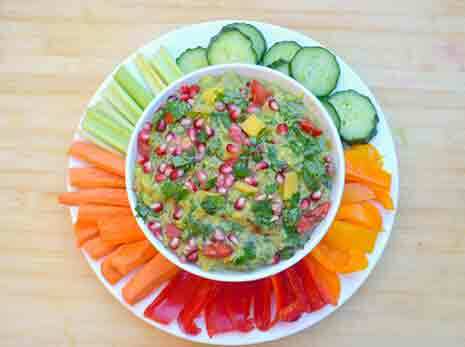 This Mango Pomegranate Guacamole Dip is perfect served with cut up vegetables. 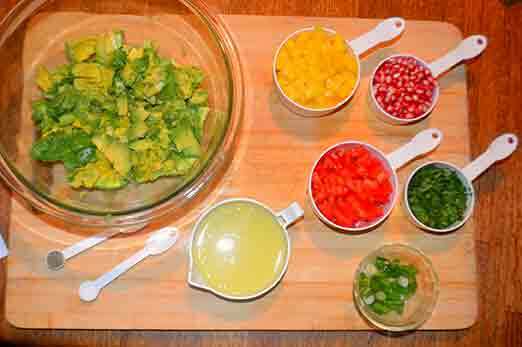 Chop the avocado and place in a large bowl. Chop the tomato and the mango. Remove the seeds from the pomagranite. Measure out the salt and pepper. Mash up the avocado. I use a masher that you would use to mash potatoes to do this. You could also use a fork. Chop the vegetables for dipping. This Guacamole is so delicious. The Pomegranate Seeds add a tangy zest. Yum! Thanks. I am so glad you liked it.